Well that should be interesting. In a curse (may you live in interesting times) kind of way. Most of them will be off panel. Yes, it’s going to be a heavy task, BUT- it’ll mean seeing all sorts of possibly interesting new characters that Aaron may one day write about. For example, we still don’t know who flying fiery girl and alien boy from the last story are. Also, it’ll give us an idea of who’s still enrolled in PS238 after the exodus of some students to Praetorian Academy. I hope to see Satori Deacon and Kent Alec again. Lastly, most Praetorians will have the same looks anyway. My GOD his parents are just… just awful. So they invite every kid with powers & leave out the two who don’t… Those Meta-Supremacists disgust me. does this invitation to Meta-kids mean that Tyler isn’t invited to his own party? What’s worse than forbiddance? Acceptance. This isn’t acceptance. This is taking Tyler’s request/idea, and changing it to be all about themselves (and probably Toby, although I’m confident Toby had no input on this either). I suppose that technically, Tyler and Ron can find one room (or large closet, even), move a game console in there, and just avoid the screaming chaos of a mob of kids they mostly don’t know, other than to make occasional pizza raids and bathroom breaks. No doubt while they do so, Zodon and Von Fogg (and other villains on the make) will be using the chaos to probe the defenses and technology of the Earth Defense League, plant various backdoors and Trojan horses, and otherwise get up to mad shenanigans. With Angie coming up after them, “fixing” things to not be quite so world-conquering, but no less dangerous. Okay, show of hands: Who did NOT see this coming? Also, making book on whether Toby’s powers just flared up again. Ante is a pint of blood to the Red Cross. I doubt this is Toby’s work, though. This is the kind of well-intentioned but actually cruel thing I’d expect from Tyler’s parents. Whelp, let’s go over the possible reasons shall we. 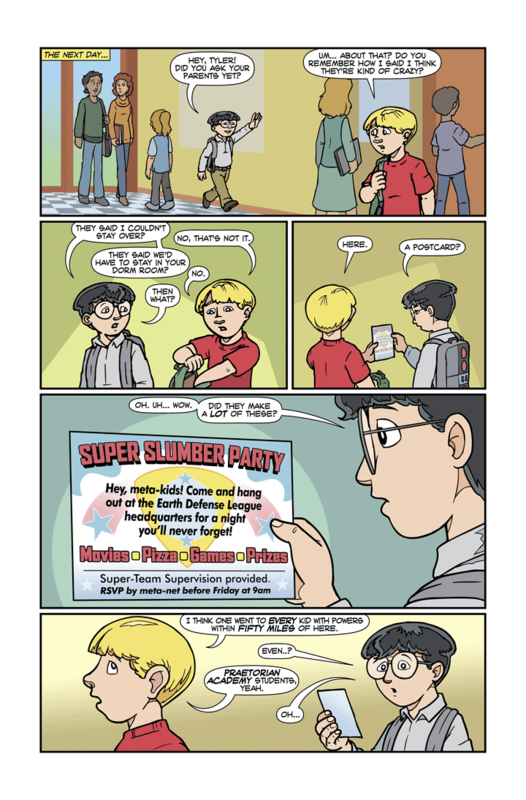 Misunderstanding: They actually think they are helping Tyler by inviting all of his possible classmates, maybe because if he hung out with them outside of school he’d be more likely to be in situations that’ll give him powers (and then they would have two superpowered sons). Competition: Any parents can have a normal sleepover, let’s show how great we are by have the biggest best possible sleepover. Overcompensation: They can sense on some level that they are bad parents, so when given a simple request from their son who is at this point almost completely independent of them, they jump completely over do it. These three seem most likely to me. Favoritism: Tyler knew his parents wouldn’t listen to him so he asked Toby to make the request on his behalf, but the parents are making the sleepover the way they think TOBY would want it. Or a worse possibility, they thought he _was_ Toby asking them. That’s not “kind of crazy”, that’s “a lot crazy”. ^_^ I know it’s probably a minor art-goof, but part of me wants these cards to sense orientation and switch between portrait and landscape in panels 3-5. It’s perspective. Note how the text is horizontally compressed in panel 3. Yep, it’s probably just perspective… But I wouldn’t put it past Tyler’s parents having a Techwiz create a postcard that changes orientation landscape / Portrait. Just to show how extra-special their party / sleepover will be. I hope that they included Cecil in the invitations. I’d be surprised if Tyler was even allowed home that day. Actually, unless you count Cecil’s collection (and detection) none of the three have powers. Do Tyler’s parents know that Ron is depowered? Because they might have meant to invite him and the invitation got lost in the mail or something. On the bright side, maybe we’ll get to see all the kids who switched schools. What is Angle like now, for example? Don’t know what you’re talking about. They did a deal saying that multiple people switched schools, and then we never saw Angie again. We know that they were taking the kids having problems. The excuse for us not seeing them was that they switched schools. I have a feeling this will be a bigger trial to Ron than Tyler. And Charles will be a beast to both… maybe getting an overdue bigger fish lesson? What Tyler really wants and needs is just plain acceptance from his parents, and that lack can warp one. Aaron is driving me to fanfic, at this rate, just so I can deal with all this. True. They just have a very bad habit of implying it, whether they mean it or not. Remember when they sent him to occult studies, and everyone figured they were hoping he’d get bitten by a werewolf or something? How about when they signed off on the radiation exposure form for the moon trip explicitly saying that they’d like to see Tyler exposed to cosmic rays so he’d get powers? Talk about child abuse. That was conveniently slightly before and potentially good timing for if something did happen. That form was open ended regarding both time and the nature of danger with power giving potential. Yep. And, honestly, the reason they want him to have powers likely has nothing to do with his self-worth at all. More than likely, they know just how badly they relate to non-powered people and want to find some way of relating to their son. Tyler’s mom and dad don’t seem to have any mundane experience — they literally don’t know anything about “normal”. Tyler’s parents are suffering from a god complex, they see themselves above the puny mortals that they watch over and as a result the idea of having a mortal son is inconceivable to them, they MUST have a child of power because they’re that special and it would violate everything they believe about themselves particularly their belief that they and everything they do is backed by cosmic Destiny. It’s why they spend all their time with other ‘gods’ and like in this case want their offspring to spend time with other godlings by taking his sleepover request and raising it up to Eleven. So… the two supremacist morons aren’t ignoring Tyler’s existence completely anymore due to Toby’s existence and b0rked-up powers? Nightmask, I think that’s the best summary of the Powers’ mindset offered so far. So, praetorian kids being evil, headmaster scheming, the competing evil kids, and with all the kids in one place and masses of super teams in the town with EDL back door access via PS238 (which might get broken), I’m expecting a big plot involving kid rescue. If I’m right then the massed super teams will decide it was an error to put all their eggs in one basket and go back to where they originally were based. Oh, and because it’s obvious, moonshadow saves the day and nobody knows how he got there. I suspect we will see the space station under PS238 going back into space for the rescue, the destruction of the school will probably be required getting it out. A teleporting hero helping during the rescue and the pupils from PS238 needing to attend praetorian for a while. To be fair, most of the Praetorian kids we’ve seen weren’t actually evil. The Von Foggs aren’t superpowered per se, they’re just highly intelligent, aren’t afraid to use their intelligence to achieve their goals and have some rather cliche ideas on how to do it. Heck, the sister wields a remarkable ace in the hole by knowing who The Headmaster actually is and what he’s doing in the senate; if she were so inclined, she could incite a school-wide shutdown not to mention one heckuva political scandal. Unfortunately, (or perhaps fortunately), Von Foggs simply don’t work that way. Their intelligence is their superpower; back in issue 50, the Headmaster noted that Lady Alexandria’s “parents were meta-level intellects”, and that her genes “contain markers that show alterations by whatever is the root cause of metahuman abilities”. Also, it’s not so one-sided in Alex’s favor as you say. The Headmaster and the Proctor are already setting to motion their plans to take over the Von Foggs’ wealth. I feel a bit torn on that subject. On the one hand, the Von Foggs are more than due being taken down a few hundred pegs. Best-case scenario is that the Von Foggs go after Praetorian Academy at the same time that the Headmaster goes after their money and the whole thing ends up in a huge wreck that robs both of them of significant resources. Apart from anything else, she’s a little girl. Provided the Headmaster can suppress, bypass or overwhelm her gadgets somehow, she’d have less chance of surviving a direct attack than Tyler would. If nothing else they could use some time (like a few months minimum) totally depowered and having to deal with living like the powerless people they see themselves above and who shouldn’t even try to solve the world’s problems because that’s for those with powers to do as they see it. Have them learn what it’s like (because clearly they’ve had powers long enough they can’t remember NOT having them) might help save their souls in the end and improve their heroics by having them actually understand what it’s like being a non-powered mortal (much like how Crusader from Love And Capes strives to live like a mortal being an accountant and loves his eventual wife because she helps keep him grounded rather than coming to see himself above everyone like the Powers see themselves). My guess is that either Tyler and Ron will attend, feel out of place, and bail on a grand adventure (possibly with Cecil and the Flea), or that Ron will go in an anonymous, face-covering costume. I kind of vote for the costume. Whether he knows it or not, I’d like for him just once to feel what Moonshadow feels.